Today I’d like to share a truly remarkable immune boosting drink that includes two of my favorite, and somewhat unlikely companion ingredients, beets and basil. For some reason many people aren’t excited about incorporating beets into their daily food choices. Perhaps some holdover from childhood. However when you read the many healthful properties they offer, you’ll see why I’m offering a creative way to disguise their taste so they can be included in your blended drinks this season. I think one of the tricks of this recipe is to add basil. It freshens the taste and has many immune boosting benefits of its own. Beets are a unique source of betaine, a nutrient that helps protects cells, proteins, and enzymes from environmental stress. They’re also known to help fight inflammation and improve vascular risk factors. Additionally, they help boost stamina, may help to lower blood pressure. High in immune-boosting vitamin C, fiber, and essential minerals like potassium, they help protect healthy nerve and muscle function. They also contain manganese, which is great for your bones, liver, kidneys, and pancreas. They contain the B vitamin folate, which helps reduce the risk of birth defects and they also assist in detoxification of the liver. This low-calorie herb is rich with antioxidant, anti-inflammatory and antibacterial properties. Basil offers essential nutrients including vitamins A, C and K, as well as manganese, copper, calcium, iron, magnesium and omega-3 fats. No wonder it’s so wonderful for you! Lemons contain outstanding phytochemicals that are high in anti-oxidant and anti-cancer properties. They are potent detoxifiers with anti-biotic effect that is protective against bacterial poisoning. Greens such as kale, spinach, and Swiss chard are immune-boosting foods that contain high levels of vitamin C. Kale both packs a powerful antioxidant punch, as well as helping fight off infection and regenerate other antioxidants in the body, including vitamin E. Greens also contain folate, another immune booster. The soluble fiber in and apple boosts the immune system as revealed in an interesting study reported in Science Daily.The National Institutes of Healthy (NIH) reports that apples have been found to have very strong antioxidant activity, inhibit cancer cell proliferation, decrease lipid oxidation, and lower cholesterol. They contain a variety of phytochemicals, all of which are strong antioxidants. This information certainly helps me understand clearly why the old adage, “an apple a day keeps the doctor away” is still true today! ¼ Lemon – if organic, leave on skin. If you like “tangy”, add more Lemon. I find my blender works best if I add my chunky beets and apples first, then the ginger and lemon. I follow up with the lighter greens and basil and finally pour in water and ice. More water can be added for a more liquid consistency. Be sure to put your lid on securely. After all, you have very red beets in there. I’m sure you don’t want splatter in your kitchen. Now it’s time to blend until smooth. Let me know if you find this drink as refreshing as we do! This drink can be stored in an airtight container in the refrigerator for 24 hours. 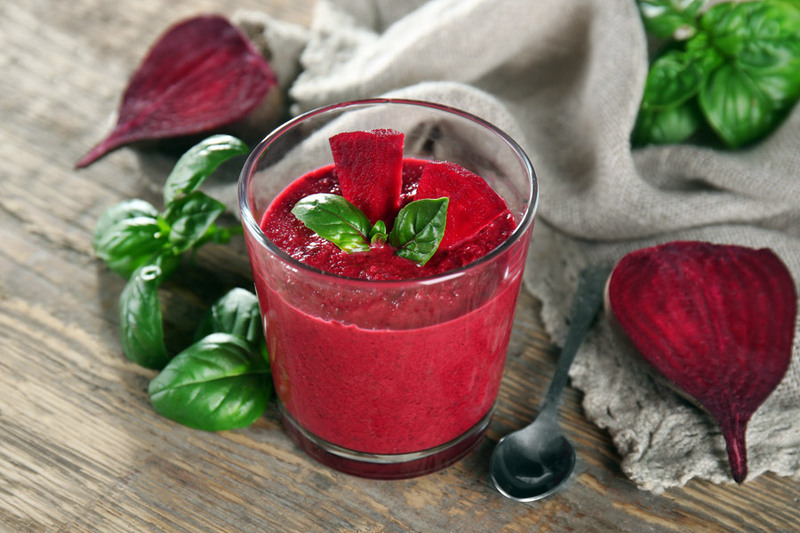 The Great Beet Cover-Up provides approximately 21.7g Total Carbs, 5.1g Fiber and 5.5g Protein per blended drink. (nutrient values calculated per NutritionData. Important note: All ingredients added together offer only 3.3 teaspoons of sugar in total per the Teaspoon Tracker calculation in Skinny Gut Diet. Beets – you can include the Beet Greens if you have them. Apples – I choose Granny Smith Apples for their comparatively lower sugar content. Any Apple will be delicious. Kale – you can substitute Spinach, Swiss Chard or Beet Greens, even Collards or Broccoli leaves. Lemon – you can substitute Lime for a different taste sensation. Limes provide great immune boosting properties too.